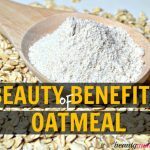 5 Soap Alternatives for Psoriasis - beautymunsta - free natural beauty hacks and more! Are you looking for soap alternatives for psoriasis? I’ve got you covered with 5 good ones you can use without irritating your skin! Grind up 10 soap nuts in a coffee grinder till powdered. Now boil the powder in 1 ½ liters of water for 30 minutes. Turn off the heat and let it cool down completely before straining into a jar. 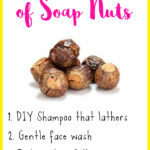 Your soap nuts liquid is ready! Store it in the refrigerator for 3 months. 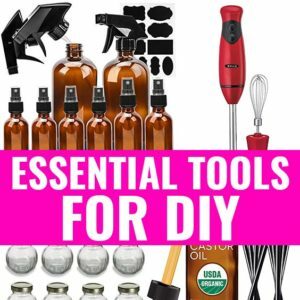 Pour ¼ cup of it into a foaming soap dispenser then add ½ cup of distilled water. Next, add 5 drops lavender essential oil. Shake well to combine everything and your body wash is ready. Gently soap up your body with the foam or add to a washcloth for more scrubbing action. African black soap is another natural soap used by the ancients. It originates from West African countries like Ghana, Nigeria and others. African black soap is all natural, made of ingredients like cocoa pod leaves, shea butter, It forms a lather too! Liquid castile soap is not a conventional soap filled with chemicals and artificial fragrances. It’s a natural vegan soap that gently cleanses skin without irritating it. 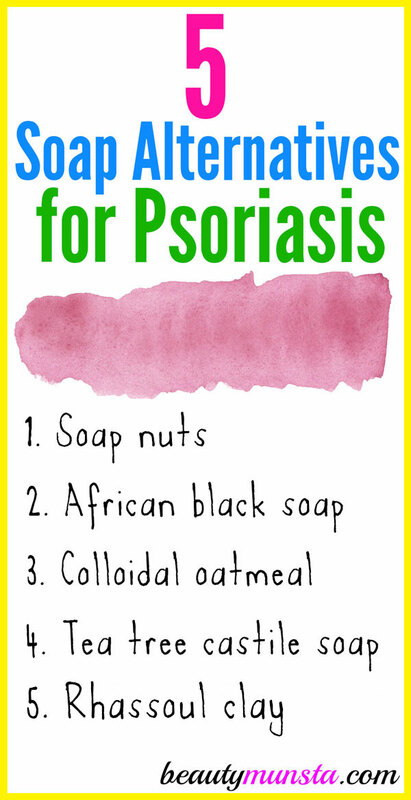 It forms a lather too so it’s a good soap to start with when looking for conventional soap alternatives for psoriasis.That’s the reason I added it to this list. But if you’ve used it before and don’t want it or if you want a completely non-foaming soap, then skip this point and move to point 5 below. Tea tree castile soap from Dr.Bronner’s is a gentle but effective soap for psoriasis. 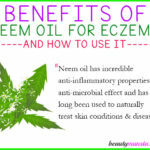 Many people have found it helped clean their skin without irritating it. Simply add ¼ cup of tea tree liquid castile soap to a foaming soap dispenser, add 1 tbsp vegetable glycerin and top off with ½ cup distilled water. Gently apply the foam on your skin or use on a washcloth. In Morocco, rhassoul clay has been used to cleanse the skin for centuries. In fact, the clay is mined specifically for beauty purposes. It is used to cleanse the face, body and hair! To cleanse your skin with rhassoul clay, dump about 1/2 cup or 1 cup of it into a bowl. Now slowly add enough water while stirring to create a smooth paste. You can use cooled green tea or rose water instead of water, if you want. Also add essential oils to give it a good scent. Now rub this clay paste all over your body then rinse off with water. Your skin will feel clean and amazing! *This is not a true soap alternative as it contains Dove soap (with other healing natural ingredients added to it) so that’s why it’s number 6 on this list of 5 soap alternatives. But I promise you many psoriasis sufferers have had good results using Dove soap. But instead of using the bar, which can aggravate your sensitive skin, make a body wash with it! I recently shared how to make a simple DIY Dove Body Wash on the blog. Check it out! 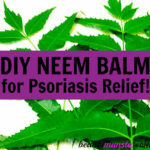 Although it does contain soap, it has turned out to be good for cleansing skin with psoriasis! Do you know of any other soap alternatives for psoriasis? 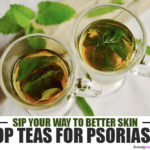 What natural soaps have you used for your psoriasis? Please share below!